Astral Projection(or astral travel) :An esoteric interpretation of a type of out-of-body experience that assumes the existence of an "astral body" separate from the physical body and capable of traveling outside it. Astral projection is experienced as being "out of the body". Unlike dreaming or near death experiences, astral projection is practiced deliberately. Aura Reading: The aura is a set of cascading colored outlines emanating from the surface of the body which differ from one person to another in terms of size, shape, intensity, and color. These energy fields that emanate from all living beings and even objects may have an aura. Aura reader, psychics and clairvoyants can see or sense this aura, observe each characteristic and interpret their meaning to the individual. Automatic Writing: Automated Writing is Writing through the subconscious mind without conscious thought, or through the guidance of an outside intelligence. Automatic writing is one method that psychics can use to bring out their psychic energy and describe it to others.This is also used as a form of Divination. Channeling : is the reception of thought from the spirit world for the purpose of communicating with spirits (non-corporal entities, spirits of the deceased, or nature spirits) and angels. The person receiving and passing on the information is called medium or Channeler. Clairaudience : The ability to hear things outside the range of normal perception, or to hear sounds inaudible to the normal ear, such as spirit voices, or even the cry of a loved one who is miles away. It is a form of "inner hearing" in which one can "hear" something internally that is not present externally at the time. 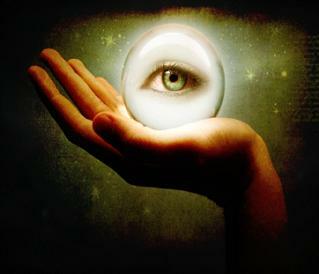 Clairvoyance :This form of E.S.P is often referred to as "second sight". It is the ability to gain information about an object, person, location or physical event through means other than the known human senses. By tapping into the 6th Sence one has the ability to see visions of that which is hidden or far away. Clairvoyant vision may also be independent of normal eyesight and exercised by the mind without the assistance of the physical 5 senses. Clairvoyance also includes seeing through the space and time and detecting the energy like radio waves. Clairsentience(also know as psychometry) : The ability to feel or know information about something without seeing it. It is also the ability to hold an object or touch someone and sense the energy surrounding that person, object or place, and even to sense where the person or object has been. Sometimes clairsentients can "feel" this information within their body as tingles or other sensations. Divination : A broad term that includes fortune telling, precognition, prophesy, and other methods used in an effort to predict the future. Objects are usually used such as Ouija Boards (to communicate with spirits), Tarot Cards, Runes, etc, and can also involve things like Crystal or Mirror Gazing (scrying) and even the reading of the Palm or Tea Leaves. See also Methods of Divination section on this site. Empathy : The ability to recognize or understand another's state of mind or emotion. It is often characterized as the ability to "put oneself into another's shoes". It is also the talent to sense the needs, drives, and emotions of another being or animal. Psychic ability can often reveal itself through the development of empathy. Empathics can also be called sensitives. These individuals can also pick up a lot of negative emotion and may have trouble discerning their own feelings and energies from anothers. Intuition : A knowing without the use the physical senses. Intuition means immediate apprehension, cognition or direct knowledge without using the normal thought processes or logical inferences. This is a common ability that most everyone has experiences at one time or another when we get a "hunch" or a "gut feeling" about something or someone. It is similar to clairsentience. Levitation: Not a very common for of Psychic Ability but listed here nevertheless. The ability to cause one's body to hover off the ground, or in general, the rising of physical objects or of human beings into the air, contrary to the known laws of gravitation and without any visible agency. More often the term is used in a restricted sense and refers to the levitation of the human body. Precognition This is the ability to literally "know the future", but often not the specific details. Usually this ability refers to knowing general outcomes of specific courses of action, with occasional flashes of detailed insight. A related term, presentiment, refers to information about future events which is said to be perceived as emotions. These terms are considered by some to be special cases of the more general term clairvoyance. Psychokinesis(Also known as Telekinesis ) : The ability to move objects from one place to another without using physical contact, or even the re-shaping of objects using the mind's energies, such as bending a spoon, or key, by just holding it and focusing. The energy to move or bend an object is created by a person's thoughts created by their subconscious mind. Psychometry :Also known as "object reading", psychometry enables a psychic to pick up on psychic impressions (vibrations) left on an object by someone connected with it. Someone with this ability could use an unfamiliar object to reveal much about its owner. Pyrokinesis :Very Rare. The ability to ignite, move and control, or extinguish fire using only the mind. Popular in many works of fiction and not many real documented cases of this ability exist although anything is possible when it comes to the mind. Pyrokinesis can also involve the ability to control heat iteself. Telekinesis (Also known as psychokinesis) : The ability to move objects from one place to another without using physical contact, or even the re-shaping of objects using the mind's energies, such as bending a spoon, or key, by just holding it and focusing. The energy to move or bend an object is created by a person's thoughts created by their subconscious mind. Telepathy :The ability to communicate mind-to-mind with another by means beyond the physical five physical senses. The transfer of information of thoughts or feelings between individuals and sometimes intuitively with animals through the use of the 6th sense. Often referred to as "reading minds" and includes knowing what someone is going to say before they say it, or knowing what they are thinking. Take the Zener Card Psychic Test. and get 3 Free Minutes with a top-rated psychic of your choice.